Alternative title: "I don't think that's going to buff out". Seriously, imagine your beloved Porsche is at the body shop waiting for you to pick it up after having some slight imperfection taken care of. Then, the phone rings. It's the body shop calling to tell you that your Porsche is done, completely and totally DONE. At least that what we imagine must have happened today to the owner of this poor Porsche. 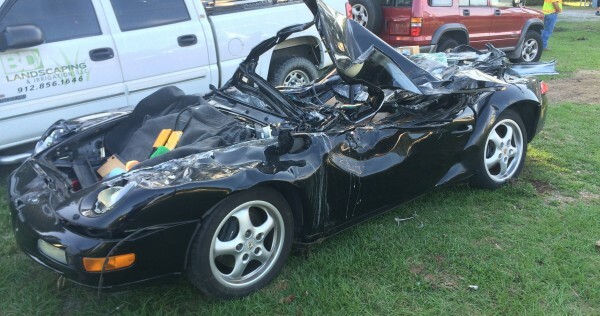 According to the stories we read, a Porsche (the model isn't identified, and it's a bit hard to tell, but we think it might be an early model 993) was parked at a body shop in Faulkville, GA, waiting to be picked up, when the driver of a box truck lost control, careened off the road and put a whole lot of hurt onto the Porsche. Thankfully, no one, other than the Porsche, was hurt. The crash was big enough to close down the road for some time and is still under investigation. Let's have a moment of silence for a fallen brother. Doc423, look at the lights, wheels and front end, def not a 987, one may get an early 986 confused, but the rear lights give it away that its a 993. Too bad for the owner….but hopefully it was insured properly. Glad no one was injured. William, yeah, probably right, but knew not a early 986 because of the lights (no fried egg). Also you mean you hope the trucking company was insured properly…. HAHA, this is from my shop. Its been awhile and I thought I would google it to see if it was out on the internet. It was a 96 911. That was a crazy day.